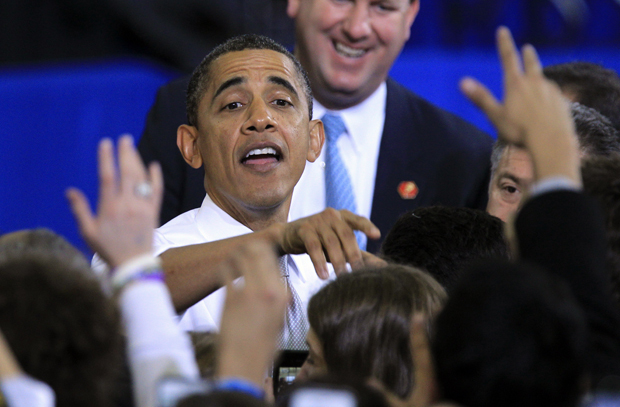 President Barack Obama greets supporters in Ann Arbor, Mich., in January. 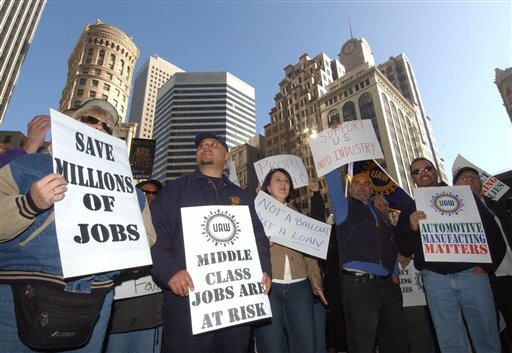 Auto industry workers and supporters demonstrate outside the office of Sen. Diane Feinstein in 2008, when top executives from the Detroit automakers spent two consecutive days on Capitol Hill pleading for $34 billion in loans. So you think the job report made these last few weeks President Barack Obama’s worst time ever in office? There are only a handful of months before the general election, and there’s not even the vaguest twinkle of hope of an uptick before then. Or maybe you think it was Scott Walker’s resounding recall victory in Wisconsin, trouncing the Democrats in a badly needed swing state and stealing momentum? The GOP not only retained control of the state, but put on a convincing ground game while draining union coffers that would have gone to Obama in the fall. Or – talk about indignities – the continuously disliked-by-the-voters Mitt Romney out fundraising him for the quarter? And I’m not talking about shadowy PACs here – the Republican affiliated Restore Our Future and its ilk have always had a substantial lead on the much later to the game Dem PACs. I’m talking about Romney’s personal fundraising. So much for likability, right? All pretty bad, certainly. But here’s my vote for worst thing that could happen to you in June if you’re President Obama: In at least one poll, he’s statistically tied with Romney in Michigan. Yes, Michigan. The state that Romney thought should have its most important industry go bankrupt. Somehow, even after that, he remains not only viable but threatening. Certainly these results come from a minority poll, an outlier, and Nate Silver at the New York Times still says Obama will take Michigan, giving him upwards of 90 percent chance to do so. The shift may also be nudged by a sustained Republican advertisement barrage pounding plenty of Obama hate into Michigan brains day and night – advertisements which, so far, have gone unanswered by Obama and the Democrats, who are trying to hold on to their money at this point to better aim at swing states closer to the election. And in the meantime, the House GOP – always a beacon of transparency – interjected itself in this mess by voting last week to strip a FCC provision requiring TV stations – in Michigan and elsewhere – to reveal online who’s buying what ads for how much. The info was already available, but citizens had to go to the stations to retrieve it. Making the info convenient to the average Joe, the Republicans reasoned, is a huge burden on the TV stations, which are already making millions from this election. One GOP congresswoman even bemoaned that the stations might have to hire someone to get this done. The kicker? The GOP did not object to any other part of the FCC requirement to post information online – only the section about political ads. If you ask me, they&apos;re awfully transparent about their desire for a lack of transparency.